Madpet Skateboarder 2 (23698 trailer views) - PLAY IT! Description: Perform tricks and stunts on top of buildings in this new sequel to a popular game Madpet Skateboarder! 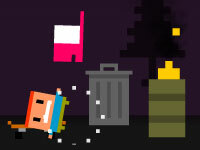 Complete challenges, collect stars and avoid falling off the roof tops.